Chinese citizens have reacted with anger and alarm at news of a massive illegal vaccine operation uncovered in Shandong province. 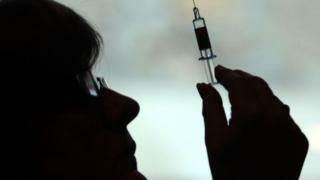 The illegal vaccine ring involved hundreds of people, and affected 24 provinces and cities, local media said. On Monday, news that a boy had died after a vaccination sparked more anger, though officials said there was no link to the Shandong scandal. China has seen several health and safety scandals in recent years. The illegal vaccine ring was said to have been in operation since 2011. The ringleaders, who have been arrested, were allegedly a mother and a daughter who purchased the vaccines from licensed and unlicensed sources, and then sold them on to illegal agents or local disease control and prevention centres for high prices, reported Xinhua state news agency. The $88m (£61m) worth of vaccines were not adequately refrigerated nor transported in approved conditions. The potentially compromised vaccines could cause disability and death, Xinhua said. Though authorities had known about the ring since April last year, they only made the news public late on Friday when they issued a call demanding that suppliers come forward to help them trace potential victims. It sparked fury over the weekend as thousands of users on microblogging network Sina Weibo questioned the delay. "This is such a huge case and not a single regulatory official has come out to apologise, not a single one has resigned... this system which doesn't care whether ordinary citizens live or die makes one's soul tired," said one user. "24 provinces, 5 years already, and how many children!... It's been nearly a year and then they reveal this! Isn't this genocide? Words cannot express how angry I am!" said another. Authorities appeared to respond to the public anger and calls for more information by promising on Monday to punish those responsible. They also released details on the affected vaccines, which included those for polio, rabies, mumps, encephalitis, hepatitis B and meningococcal diseases. Also on Monday, authorities in Guangdong province confirmed that they were investigating the death of a four-year-old boy who had died in early March, days after he was given meningococcal and polio vaccines. Though they stressed that it appeared to have nothing to do with the Shandong vaccine scandal, it did not stop sceptical netizens from making the link. "If the exact cause is still being probed, how can you already say that it has nothing to do with the problematic vaccines? You're tying yourself up in knots," said one user. Public confidence in China's health system and food safety regime has been shaken by a number of scandals in recent years, most notably in 2008 when melamine was found to have been added to milk powder, resulting in six babies dying and 300,000 falling ill.